Currently, all .AU domain names must be registered under a second level domain, for instance “yourname.com.au” or “yourname.org.au”. Based on the survey conducted by the Registry and sent to 97,000 randomly selected registrants in COM.AU, NET.AU, ORG.AU, ASN.AU and ID.AU, 60% of respondents appear likely or highly likely to register a “yourname.au” name, if it was available. 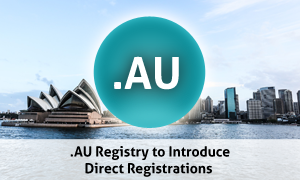 add value to the .AU domain name system for all kinds of user operations: registrars, resellers, and registrants. The next step in the process of implementation of direct registration in .AU is determining the best approach by developing comprehensive policy and continuing stakeholder consultation. Further announcements by the .AU Registry are exptected to be made during the year as the implementation work progresses. In the meantime, you can still register attractive domain names in the Australian domain using our Local Presence Service. Use our search tool to see if the name you are looking for is available. If you have questions or need more information on .AU domains, please contact us at support@web-solutions.eu. Contact us to register .AU domain name at relations@web-solutions.eu.